﻿﻿ Rick And Morty Showed Up Briefly On My Little Pony on Readyforgame.com - Free Online Games! The wait for Season 4 of Rick and Morty continues, but in the meantime, how about a My Little Pony cameo? 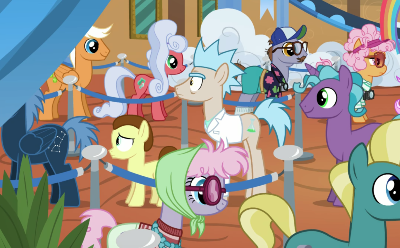 Yes, for whatever reason, a new episode of the ongoing TV series My Little Pony: Friendship Is Magic featured a pair of ponies who look suspiciously familiar if you're a Rick and Morty fan. As discovered by Reddit user Roxopenguim, Season 8, Episode 5 of My Little Pony: Friendship Is Magic features an extremely brief shot of a waiting line. Right in the middle of the screen are two ponies who don't match up with everything else--one with spiky blue hair and a lab coat, the other with yellow skin and brown hair. Did I mention the episode is called "Grannies Gone Wild"? This appears to be nothing more than a brief homage on the part of My Little Pony, rather than any kind of proper crossover. Still, it's something to see. You can check it out in the image above, which was captured by io9. Rick and Morty, meanwhile, had its own weirdness to share recently for April Fools' Day. Adult Swim directed fans to its website, where they could watch a short titled Bushworld Adventures. It came from YouTuber Michael Cusack and is one of the more vulgar things from the show to date. As for Season 4, there's still no official word on when it will happen. It might be as long as late 2019 before we get a new episode.